Pros and hobbyists alike, tell us our Race Seat Install Kits are the best anywhere! VAC BMW Race Seat Installation Kits are by far the easiest, most popular and best way to mount race seats into your Z series, period. Our acclaimed Race Seat Installation Kit is a nearly 100% universal application that will work with almost any side mount sport or racing seat and allow a properly centered and comfortable driving position. We originated this patent pending design and have sold these kits to hundreds of BMW enthusiasts around the world. These have been used to install popular brands including: Sparco, Cobra, Status, MOMO, Bride, Recaro, Sabelt, Kirkey ect. some Racetechs may require slight modification to the kit but the majority do not. These kits are available in combination of silver and/or black, and include both VAC Floor Mount Adapters, VAC Superior Side Mount Brackets, and all necessary hardware. 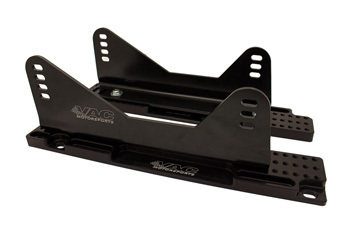 If your looking for a 100% bolt in install of everything including your Harnesses; add our Anti-Sub mounting Bracket and our Lap Belt Mounting Bracket Kit, both available below. From Samer AlZeer of Dubai, United Arab Emirates on 3/20/2016 .